The trail of a serial killer on the borders of Texas and Chihuahua leads to a joint investigation on both sides of the border, lead by one detective from each side. Where can you stream The Bridge? 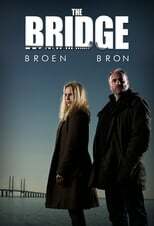 On 2011-09-21 Crime/Mystery TV Series The Bridge first aired on SVT1. Written and created by Hans Rosenfeldt, and produced by Filmlance International & Nimbus Film, The Bridge has ended and last broadcasted on 2018-02-18.